Yeah summer! Get Rock’n Coshocton! 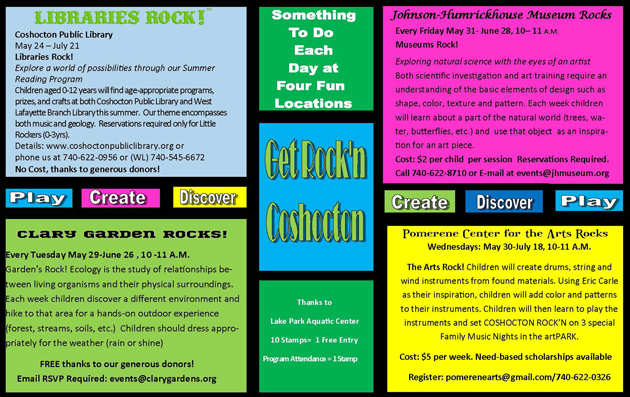 GET ROCK’N COSHOCTON is a collaboration between the Coshocton Public Library, Clary Gardens, the Johnson-Humrickhouse Museum, and the Pomerene Center for the Arts, to provide meaningful education centered in the arts to our children and our community throughout the summer months. There is something FUN and EDUCATIONAL to experience Monday through Friday at one of our venues each day… (INFO LISTED BELOW). 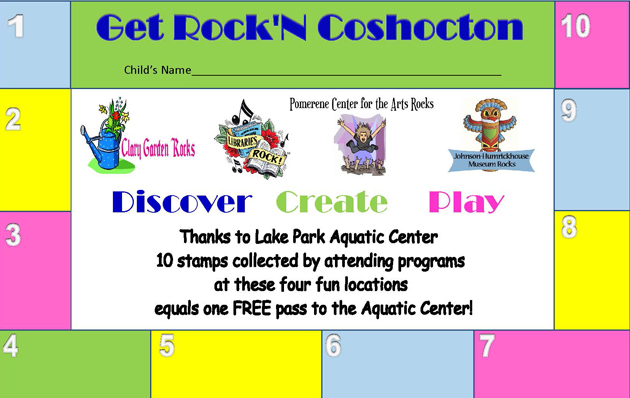 **Thanks to Lake Park Aquatic Center, 10 visits to any of these ROCK’N venues earns ONE FREE POOL ENTRY! Here at the Pomerene — ART ROCKS happens Wednesday mornings starting May 30th for children preschool through grade 8 (preschool 9-9:45am, grades k-2 10-11am, grades 3-8 11:30-12:30). It costs $5 per week (if that’s hard but you want your children involved—ask us about our need-based scholarships) Registration is required. We’ll be making drums, string instruments and wind instruments—all from found materials. Watch the video below to get inspired. We’ll add color and pattern to our instruments using the painted paper/collage techniques of famous children’s illustrator Eric Carle (author of The Very Hungry Caterpillar & Brown Bear, Brown Bear). 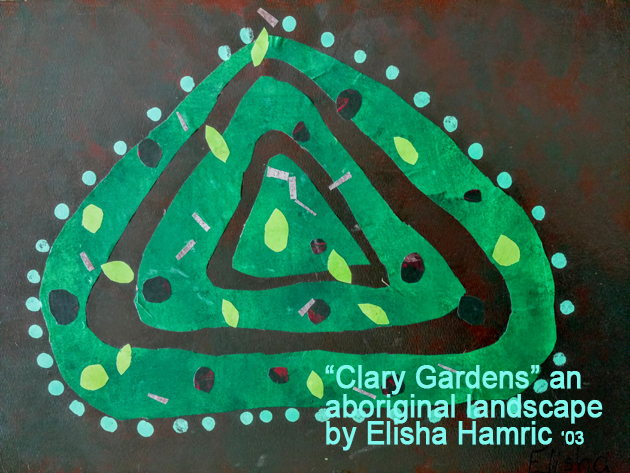 See Elisha Hamric’s landscape below to get an idea of what that might look like. We’ll learn to play our beautiful instruments & set the town ROCK’N on 3 special Family ​Music ​Nights in the artPARK.